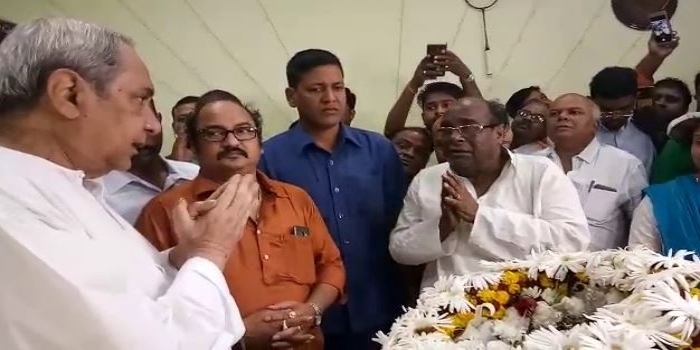 Keeping aside political differences, Chief Minister Naveen Patnaik on Thursday visited veteran politician and former minister Dr.Damodar Rout’s residence to condole the death of his wife Snehalata Mohapatra. Dr. Rout, the former BJD leader who was expelled from the party last September, joined the BJP on March 15. Since then he has been a bitter critic of Naveen and his government. Other fellow BJP leaders like Dharmendra Pradhan and Baijayant Panda were also present at Damodar’s residence. Mrs. Rout passed away at the Apollo Hospital in Bhubaneswar, where she was undergoing treatment for the past six months, early this morning. She was 72. She will be cremated at Swarga Dwara in Puri.